I was invited to speak at Smashing Conference Toronto last week. The special thing about this conference was that none of the speakers at the conference was allowed to use slides, but instead was demoing their craft live to the audience. Vitaly from Smashing Magazine always has new (and sometimes slightly crazy) ideas, but when he asked me a few months ago if I wanted to take part in a 'slide-less conference' I was immediately up for it. Many of my talks include some part where I either invite the audience to sketch along while I draw or where I use 'sketching and talking' as a format to explain concepts. Usually I have some slides to give context and frame the whole talk, but this time, everything was supposed to be live and generated in the moment. 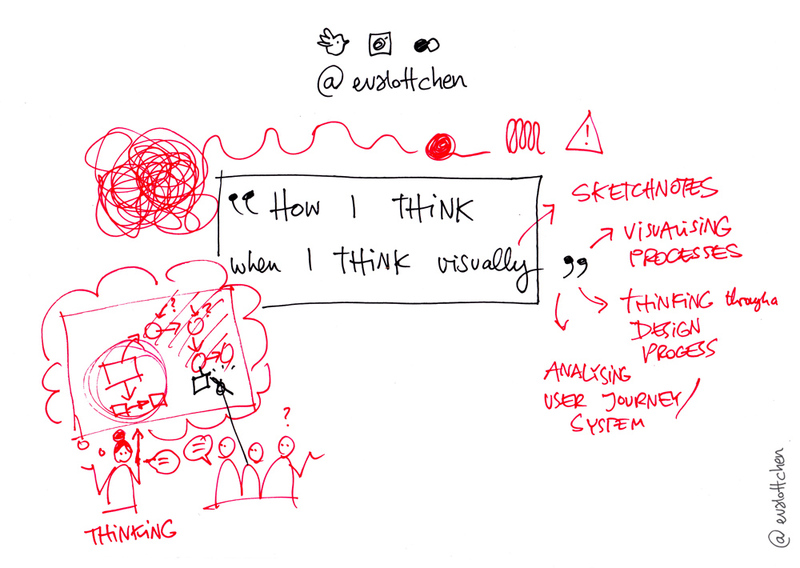 In my talk I explored 'How I think when I think visually', breaking down my process for developing the types of visualisations and diagrams I use to understand complex problems and that can help as frameworks for problem solving with others. In preparation for the talk I sketched a lot, visually thinking through different examples and tried to distill my process into a set of structured (and repeatable) steps. 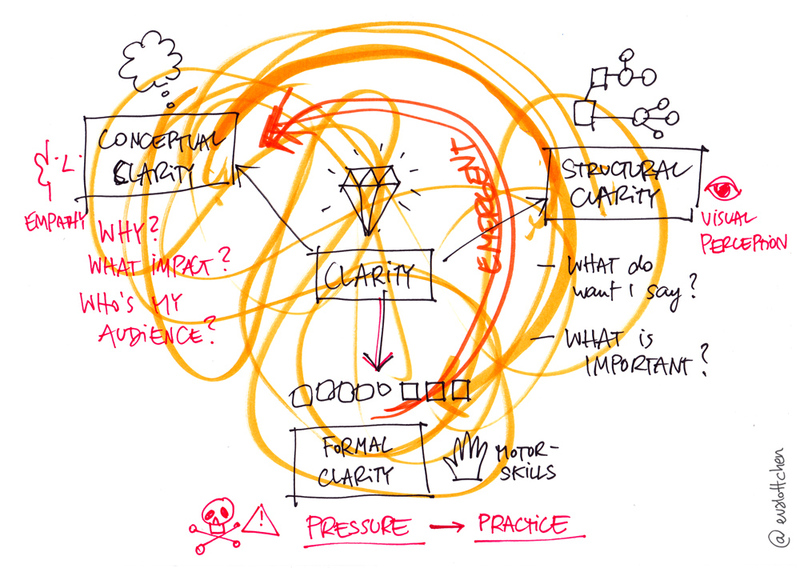 Thinking is a messy process and thinking visually is not necessarily happening in a straight orderly line either, but there are certain principles and 'modes of thinking' that I apply at different stages in the process. The talk (as the whole conference) was a bit of an experiment. Although I had practiced and made myself a nice time-boxed plan for getting through all the new material I had prepared, 40 minutes were not quite enough to get through everything. I actually think that the material will be best packaged into a full day workshop with demos and hands-on exercises for each step in the process, which I'll try to build out in the coming months. I really enjoyed the conference. Seeing other designers and developers demo the way they work was very insightful and a refreshing change from the usual slide-packaged content. I have a lot of respect for all the speakers who took on the (slightly nerve-wrecking) challenge of demoing live (with all the things that might possibly go wrong) and for the Smashing team for taking the risk of trying out this new format. I heard from several attendees that they were slightly sceptical about what to expect before they arrived, but that they thoroughly enjoyed the different approach and the more direct and authentic glimpse into how other people in the industry practice their craft. Thanks Vitaly and team for a smashing time in Canada! Here is my initial plan and the diagrams I drew live during my talk. As words and images are best friends, the sketches alone only tell half of the story and are not meant to be self-explanatory. I think the video of the talk will eventually be released. Words and images are best friends with different strengths. Combined, these become super-powers. 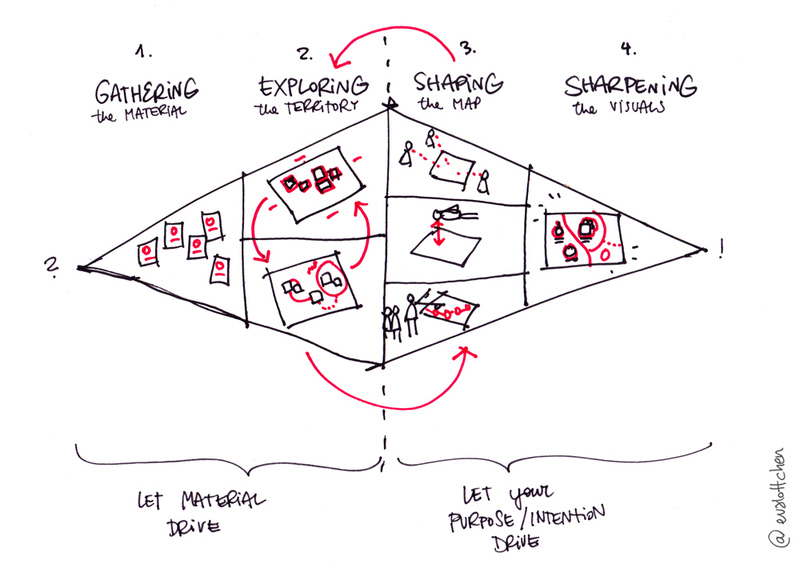 Diverging and converging – Exploring and shaping. 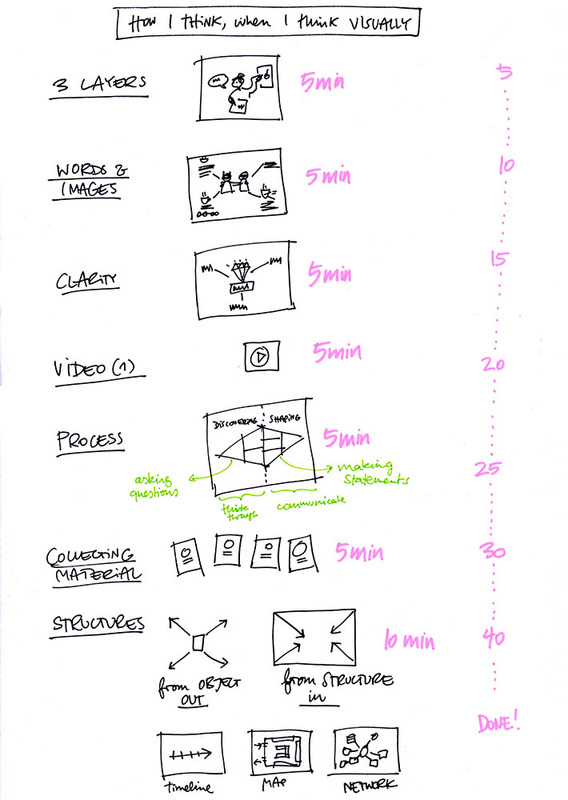 My process for thinking things through visually. If you have thoughts or questions about the material below, please leave a comment. I am interested to hear your thoughts and to develop the material further.